This summer, Brookside Church will join with Stanley Congregational Church - UCC (Chatham) for two of our Sunday morning worship services. We will meet together at Stanley Congregational Church in Chatham at 10am on July 15 with Pastor Michael and our congregation leading the worship. On July 22 our service will be here at Brookside Church at 9:30am, with Rev. Bernd Weishaupt and doctoral students O'Neil Van Horn and Jen Maidrand leading the service. Rev. Dr. Lois Wilson was born and raised in Northeastern Pennsylvania, the granddaughter of Italian Catholic and Russian Jewish immigrants. She spent 25 years in Philadelphia, where she raised five children, now young adults ages 21 to 31. (They are her favorite people.) Lois has been a home birth midwife, social worker, special education teacher, seminary professor, activist and UCC pastor. She is a writer, artist, storyteller, musician, gardener, avid reader and lover of nature. Lois holds a Bachelor’s Degree in Human Development, Masters Degrees in Theology, Divinity and Special Education, and a Doctorate in Art and Theology. She believes with her whole heart that God is Love...no exceptions! She will be serving in an interim capacity, helping our Christian Education program develop its curriculum, manage our Sunday school programming, coordinate volunteers, and help the CE Board continue to build on its strengths. We are extremely grateful that Rev. Dr. Wilson has agreed to work with Brookside in this temporary capacity, and we are excited see our CE program build momentum as it works toward seeing our congregation's vision become a reality. 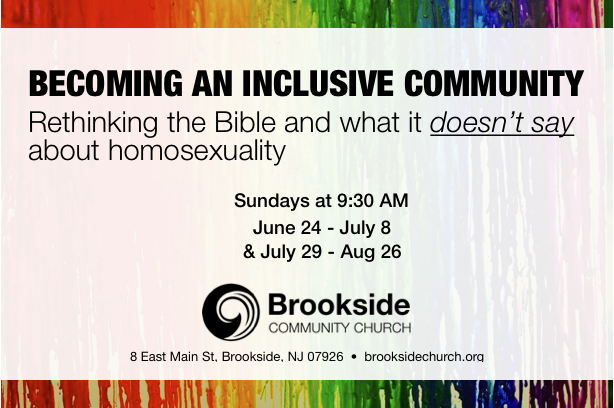 Join us this summer for a long awaited and exciting Summer Sermon Series: "Becoming an Inclusive Community." The series will begin with an introduction that allows us to be radically honest. We will talk about what can be scary about inclusivity and what can make the Bible such a dangerous book. The aim is to reimagine our church as a faith community that is working to be part of God's dream for the world, a radically inclusive Beloved Community. The series will then lead into a five part rereading of some important biblical verses. We will rethink our approach to scripture and discover the truth, that the Bible actually **doesn't say anything** about homosexuality. We understand that there may be a number of members of our church who have not participating in any real structured engagement on the issue of LGBTQ inclusivity. Our leadership is committed to making this a safe and inclusive space for everyone. There will be chances each Sunday for people to anonymously ask questions and provide feedback. Our Interim Minister, Rev. Michael Howard, invites anyone to engage in conversation with him to express discomfort or concern throughout the time of this series or after. 9:30am on Sunday mornings @ Brookside Community Church. Our service at Brookside will still meet at 9:30am on Sunday, July 8th. However, we will plan to end our worship service a few minutes early in order to allow members to arrive at the Morristown Green to join with our wider community and engage in an interfaith time of worship. We are in need of lunch servers (from 11am - 1pm) and “Black Shirt” cooks. See the sign up in Scialla Hall or contact Maria Henze at mickeymousefan009@gmail.com cellphone: 201-407-1246. For Maria Henze’s mother, who is recuperating. For Michele James’ mother Pat, who is recovering from surgery. For Karen Burns Rutigliano’s daughter, Meghan. For Edie Marucci’s brother, Christian.